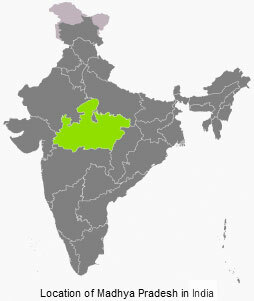 Madhya Pradesh, ‘Central Region’ lies right in the centre of the landmass of India. Madhya Pradesh awards the Kalidas Samman, the most coveted of its kind, for outstanding exponents of the performing arts, and stages an annual festival of dance at Khajuraho. The most interesting feature of the landscape is the ravines of the Chambal Valley through which flows the river Chambal. Bhopal, the capital of the state, is centered on its two lakes — the Upper and Lower and has many palaces, mosques, temples and museums of interest. It has an Institute for Theatre Arts, Bharat Bhavan. Islamnagar close by has the palaces of the Sultan's times. Among the historical sites are best known Gwalior, seat of the erstwhile ruling family of the Scindias, famous for its fort. Indore, on the banks of the rivers Saraswati and Khan, and Maheshwar of the Holkar dynasty; Panna, Orchha and Chanderi built by the Bundelas; Mandu, the capital of Parmars, the ancient town of Datia mentioned in the Mahabharat; Jabalpur, Mandla and Ginnuragarh forts of the Gonds; Asirgarh fort; Burhanpur’s medieval fort; Vidisha fort; Narwar, capital of Raja Nala’s Naisidha; and Chikold, Nowgong, Rewa, and Dhar. Pre-historic rock-cut Buddhist caves of Bagh; the famous Temple Complex of Khajuraho with its exotic sculptures; Udayagiri, site of rock-cut caves in sandstone and Buddhist ruins of Pipaliya and Satdhara; and Bhimbetka. According to the census of 2011, 90.9% of the state residents followed Hinduism, while others are Muslims (6.6%), Jains (0.8%), Christians (0.3%), Buddhists (0.3%), and Sikhs (0.2%). For religious sites of the state you can visit Chitrakoot where Lord Rama, according to Ramayana, spent his forest exile; Omkar Mandhata’s Temple on an island; the Buddhist Stupa at Sanchi; Udayapur's Neelakanteshwar Temple; Ujjain, one of the four sites of Kumbh Mela; Bhojpur’s magnificent Shiva temple; temple at Nagda; and the Jain temples at Muktagiri. Nature of Madhya Pradesh is abounds with greenery, jungles and small rivers. Pachmarhi, jewel of the Satpura range — a hill station of great beauty and treasure-trove of ancient and prehistoric cave paintings; Shivpuri, the summer capital of the Scindias; Bheraghat’s marble rocks with the Narmada flowing through them; Delawadi, a picnic site in a forest glade; Tigra dam; and Chachai, Dhuandhar and Keoti waterfalls. Diamond mines at Panna. Wildlife sanctuaries and national parks are Bandhavgarh, Madhav, Kanha, Panna.